I bought this jacket several years ago. It was made from plastic “coke” bottles by a company called N-VIRON-mental. When I googled N-VIRON-mental, no link appeared, and I’m assuming that they are out of business. When I googled “clothes made from plastic bottles,” many options appeared. 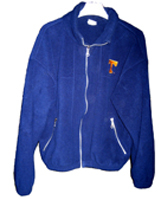 I bought the jacket because of the orange T for the University of Tennessee, my alma mater. Most sportswear for UT is orange and tacky, but this jacket was tasteful. It’s also warm and has lasted well. Since plastic takes about 450 years to break down, I should have it for a while. PlanetTrash has been quiet lately because of a bicycle accident and some routine medical tests, but all results are great. Some 15,000 pounds of trash was collected, 13,500 flowers planted, and 500 trees distributed Saturday on “Make a Difference Day” sponsored by Keep Cincinnati Beautiful. Make a Difference Day is the nation’s largest day of citizen volunteerism. About 650 volunteers from 17 Greater Cincinnati communities participated. They beautified parks and recreation areas, installed painted panels on boarded buildings, picked up litter and removed scrap tires. Jennings said there were about 40 people in the restaurant at the time. He wishes she had reached out to one of them for help. “If she had just said something, but she didn’t,” said Chief Jennings. Jennings said he has been with the department for 30 years and has never seen anything like it. “Oh lord, I have never worked a case like this before… I’ll never forget it,” he said. Sosa is still at the Cookeville General Hospital. She will face second degree murder charges when she is released. It’s difficult to get mad about finding plastic bottles along the roadside, when news as this is reported. Human beings are living beings deserving of life in an environmentally beautiful world. We are not trash. Everyday should be Make a Difference Day. A coworker turned me on to this blog, No Impact Man. But my favorite ultra-progressive, take-him-with-a-grain-of-salt columnist and uber-agitator, Mark Morford, is cracking me up. Today the San Francisco Chronicle writer, in his “Notes & Errata” column, takes on the continent-size toxic stew of plastic trash in the Pacific Ocean. The enormous stew of trash floats where few people ever travel, in a no-man’s land between San Francisco and Hawaii, according to a Chronicle story. Then there’s his eco-tourism idea. “Ah, but perhaps we are not thinking ingeniously enough. Perhaps we should consider simply turning the garbage patch into a giant Disney tourist attraction, add some platforms and some floating rides and Starbucks kiosks and funny T-shirt stands for the kiddies. You think? “Families from all over the world could float out to the GPGP on special garbage-plowing cruise ships outfitted with little detachable pontoon boats, which the kids could hop into and float out among the stew, armed with cool little nets (plastic, natch) with which they could spend all day fishing around, scooping out all sorts of magical, mysterious goodies from all over the world. Imagine! It’s like the world’s biggest claw vending machine! It’s going to take me all weekend to eat this Fiji bottle. I really like Mark Morford’s idea of setting up a Disney World on the Great Pacific Garbage Patch. Seems fitting. When I hear these lyrics, I think of construction sites in formerly undeveloped countrysides and fires in California.